O God, steadfast in the midst of persecution, by whose providence the blood of the martyrs is the seed of the Church: As the martyrs of the Sudan refused to abandon Christ even in the face of torture and death, and so by their sacrifice brought forth a plenteous harvest, may we, too, be steadfast in our faith in Jesus Christ; who with thee and the Holy Spirit livest and reignest, one God, for ever and ever. Amen. The Christian bishops, chiefs, commanders, clergy and people of Sudan declared, on May 16, 1983, that they would not abandon God as God had revealed himself to them under threat of Shariah Law imposed by the fundamentalist Islamic government in Khartoum. Until a peace treaty was signed on January 9, 2005, the Episcopal Church of the Province of the Sudan suffered from persecution and devastation through twenty-two years of civil war. Two and a half million people were killed, half of whom were members of this church. Many clergy and lay leaders were singled out because of their religious leadership in their communities. No buildings, including churches and schools, are left standing in an area the size of Alaska. Four million people are internally displaced, and a million are scattered around Africa and beyond in the Sudanese Diaspora. Twenty-two of the twenty-four dioceses exist in exile in Uganda or Kenya, and the majority of the clergy are unpaid. 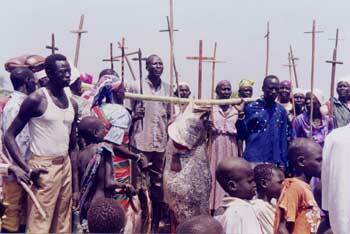 Only 5% of the population of Southern Sudan was Christian in 1983. Today over 85% of that region of six million is now mostly Episcopalian or Roman Catholic. A faith rooted deeply in the mercy of God has renewed their spirits through out the years of strife and sorrow.